The Tomoloo hoverboards come with not only unique design and some cool looking flashy lights. They have great performance and are a good fit for both kids and adults alike. Here you get a great hoverboard for a very good price. The Tomoloo hoverboards have been getting a lot of traction lately and I had the chance to test ride all their units at the same time. Who can say no to that? The first thing that I noticed is that they actually have a lot of different models but haven’t named each model to something unique so we thought we’d just combine all of their models into one large review and separate them by appearance and wheel-size. We’ve done some extensive testing to three of Tomoloo’s hoverboards and those were two different 6.5″ models and one 8″ model and they all did great throughout our test course. 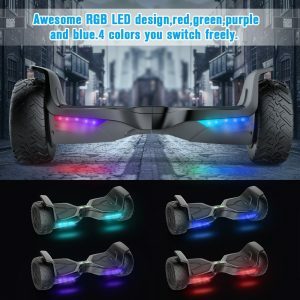 All of their hoverboards have the now famous UL 2272 certifications which are basically a safety-badge indicating that they have been thoroughly tested by the U.S underwriters laboratories and that there is no risk of fire. The battery consists of Samsung cells and has a similar certificate called UL 2271. ▶▶Unique TOMOLOO:Design inspiration comes from the mounts Fire Kylin,symbolizing invincible aggressiveness and fearless spirit. 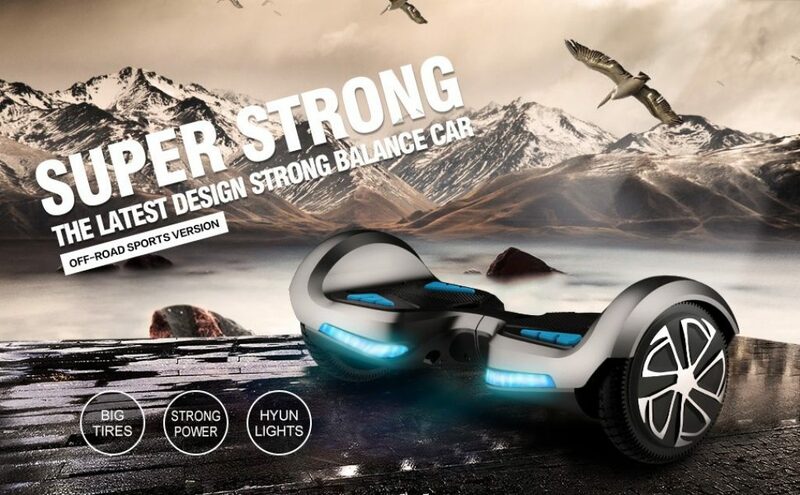 ▶▶Verified Safety:UL2272 Certified of hoverboard and UL2271 Certified of the battery,comply with all U.S safety regulations,which is with the features of high-temperature resistance and fire resistance. ✈ THE AMAZING ABBILITY OF OBSTACLE SURMOUNTING: When a small obstacle is encountered, the motor will temporarily increase power and enhance the stability of the vehicle so that you can pass it comfortably. Stronger road adaptability. Riding up to a 20-30 degree steep slope easily. After widening the foot pedal, the Max Load of TOMOLOO K3 can up to 265 pounds. So Tomoloo just launched a V2 off-road model in November 2017 just before Christmas. It took some time before we could get our hands on it to take it for a spin as it has been incredibly popular among the buyers. But now its here and we got the verdict. So the appearance is quite similar to the other 8.5-inch models, same wheel design with solid rubber tires. We have the same structure except for the foot-pads and the plastic itself. 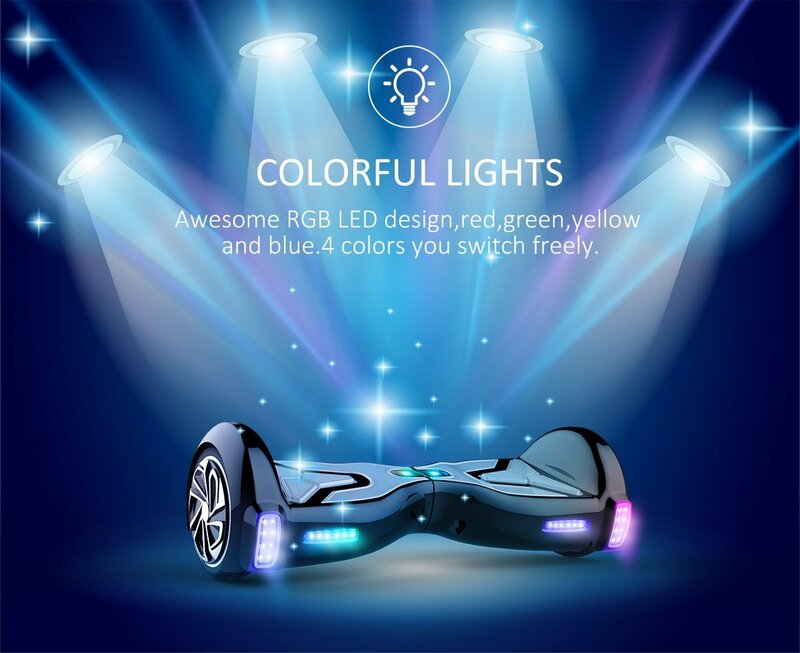 A major change is that it has the famous Tomoloo RGB lights which let you pick any color you want through their bluetooth app that now supports Bluetooth 4.1 connection giving it better connectivity and range. Superior sound comes from the built-in speakers and the current price you get alot of hoverboard for your money. This unit has the strongest motors of 350W each and is able to handle inclines of up to 30 degrees. Through the application available on both IOS and Android you can set the brightness and color of the lights, change between different user modes, adjust the speed, torque and sensitivity of the hoverboard, all this in order to customize it to your likings. So what about the riding experience. We’ll the app settings are similar to what we have on our own units back in Sweden. Being able to set these specific settings might not sound that compelling to start with. But after a while when you get more experienced you are going to go into the app and change these settings to make it perfectly fit your weight and riding style. The first item from Tomoloo is a 6.5-inch unit and I think its a good addition to the Razor Hovertrax 2.0 that we’ve tested earlier. 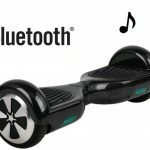 Just as the one above this one is powered by two 300 watt motors giving it 50 watts stronger motors compared to many of the standard 6.5″ hoverboards on the market. It also has the ability to be personalized with the mobile application to suit the riders most inner needs. Customize it to perfectly reflect what you want to get out of your hoverboard. The only exception here is that it doesn’t have any RGB-lights to adjust, but instead it has gotten a much cooler design and it rolls over much more smoothly when you need to dismount while riding. Which occasionally happens even to the best of us. The only exception here is that it doesn’t have any RGB-lights to adjust, but instead it has gotten a much cooler design and it rolls over much more smoothly when you need to dismount while riding. Which happens even to the best of riders and is something that should everyone should train to do on grass before really picking up speed on the streets. It comes in two different colors: Khaki and Black. Both colors are very nicely made with a matte finish. my personal favorite is without a doubt the khaki colored one as I haven’t seen that one before. The foot pedals on this model are much higher ensuring good grip and also making them easier to press down for kids of lower weight around 40-60lbs, which results in a better riding experience for young children. The biggest difference between the above 6.5-inch models and this 8-inch model is that it comes packed with even more power, 350-watt times two gives it a total of 700 watts. Strong and powerful motors provide better steering and more precise adjustment of speed that works in favor of adults. We tested it with 220lbs and it works just perfectly and the precision is mind-blowing. 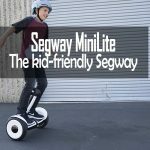 The 8-inch tires provide another great feature, increased height giving you more space underneath the hoverboard and the larger wheels also provides some peace of mind when handling small stones and uneven terrain. This model too has the RGB-light feature meaning you can open up the mobile app and switch between more colors than you can ever imagine. There is also a few lightning-modes to choose from in order to make it switch automatically between a number of different colors. Overall a great addition to the line-up of Tomoloo hoverboards and in my opinion is that it comes in at a second place. The last model tested was a 6.5-inch with RGB lights on it. This was totally new to me and for those who know me already you know me, know I fell in love with the feature pretty quickly. I really love to give my rides a personal touch. The unit moves very smoothly and even though I did one time lean over too far nothing cracked and no injuries. Note that I am an expert at failing without falling and most often you can just jump off and land on your feet, but it takes some practicing and some catlike instincts. The self-balancing is really good and turning/adjusting speed and direction are smooth and responsive so you feel as one with the hoverboard. Easy to get going with the built-in app which is downloadable for both iOS and Android. Powered with a Bluetooth 4.0 unit you get a really good connection and the speakers do perform very well, keep in mind they are small and only 5W. Has a lot of different functions to limit the speed cap and adjust the driving force to make it accelerate smoother or more rapid. The application gives you a lot of options in terms of customization and I am not just talking about the thousands of RGB light colors and different disco modes that you can choose from. The app has a lot of different functions to limit the speed and adjust the driving force to make it accelerate smoother or more rapid. With that said we really recommend any of the Tomoloo boards to kids because they have those extra features that I think kids would enjoy the most. -Well, first of all, there isn’t a big difference between them. I had a really hard time to pick out a winner but the last place was quite simple. The design of that last 6.5-inch is a bit strange and that’s the only reason it ended up coming out as a loser.